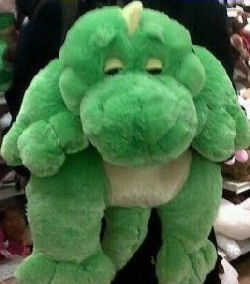 I am looking for a large floppy green dinosaur-like plush with light yellow scales down his back and a light yellow tummy. It is probably about 30 inches long. I don’t know the brand sadly, but it was sold at Giant Eagle stores for Valentine’s Day, 2011. Hence why I can’t find it now, even though it wasn’t very Valentiney at all – just a large adorable plushie, but a seasonal plush I guess. I also emailed Giant Eagle customer service to see if I could still get one, but the only help they gave me was that the company that distributed it was Far East Brokers, and I was told they don’t sell to the public. My family is going through a lot of rough things right now, and for some reason this particular plush reminds me of a simpler time, and I regret not buying it when I had the chance.